On a verdant hill, stands the Sanctuary of Our Lady of Grace; it is said that originally they were a " dacha "Basilian dating from the ninth or tenth century, as lets imagine the existence of the monastery of St. Basil. At this shrine they turned the torresi in times of doom and despair. As if to awaken the traditional devotion to Mary, the April 17, 1677 , two young girls of the place, Isabella Cristello and Antonia De Luca, went with holy fervor and much concentration to the shrine here while praying Isabella healed from serious harm that by the time ' afflicted and, at the same time attending to a vision sweetest similar to that two centuries later he had Sourbirous Saint Bernadette at the grotto of Lourdes. Isabella Our Lady asked that in that place was revered and worshiped by people near and far, and that it would distribute many graces to the faithful. The next day there appeared in procession many people, but much more, it came in the following days, as they will divulge the news of the extraordinary events. Subsequently, albeit gradually the interest was reduced to 5 February 1783 when the earthquake shook the Calabria and the church was destroyed, but the fervor of the faithful who continued to arrive from neighboring villages, wanted to be built the church despite that the statue had disappeared under the rubble and never seen again. However, they had to spend 74 years before Mary appeared in a dream to a local peasant, Pascale Luna , on a splendid throne who invited her to go to the Archpriest Don Marcello Galati to interest him in the reconstruction of the church. The dream reawakened the interest of Torresi, but the lack of resources necessary for the reconstruction, they slowly forget the promise. Once again the Lady rinverdì memory of their faithful with a prodigious. On the afternoon of April 10, 1858 , the Saturday before the first Sunday after Easter, the farmer Francesco Arone, working the land near the ruins of the church, he saw a spring of gushing water. Moved quenched his thirst, then he washed his limbs affected by rheumatism, healing immediately. Races in the country by informing friends and acquaintances. It was built immediately a committee to oversee the construction of the holy temple. The Curia of Squillace, by a decree of 8 May 1858 authorizing the construction of the church. Are immediately work began that ended September 8, 1858. The beautiful statue donated by King Vittorio Emanuele II is a masterpiece of Neapolitan. The Sanctuary, a small, but cozy, addresses the needs of pilgrims who come to many during all the holidays of the year: Easter Sunday, Ascension Day, July 2 Feast of the Visitation and September. And now we come to the conclusion in the Blessed Virgin Mary venerated in Torre di Ruggiero in her Shrine of Grace. It was April 17, 1677, when at this place, two young, Isabella and Antonina, elevavano their prayer to God and His Holy Mother, the ancient Church of the Blessed Virgin. A miraculous event involving Isabella sees the Madonna that says: "Travel to the country, tells what happened to the priests and express my desire to be revered by the people near and far." On the same day the people and some very devoted priests saw the Madonna and Child Jesus who were turning their smiles and looks of deep sweetness. With the earthquake of 1783, the church was destroyed, but a new vision in a dream to Pascale Moon, asks the reconstruction of the church, which was completed on September 8, 1858. On April 10 of that year, a farmer from the Tower of Roger, Francesco Arone, thirsty because of the work in the fields near the ruins of the Church, thought the ancient spring that flowed there.Burying the hoe shock the ruins of the Church and gushing water and he is astonished quench the thirst and washed limbs reumatizzati and immediately healed from the pain. Here, the Blessed Virgin continues to ask the Son gifts for her children I run here devoted to this Holy Mother. Many votive offerings attest to the divine protection. The statue venerated in the sanctuary of the Neapolitan school, is a gift of King Vittorio Emanuele II. In conclusion, a text that is the sanctuary is torrese: Sodaro, The Shrine of Our Lady of Grace of Torre di Ruggero.The text mentioned above can be found at the Sanctuary. 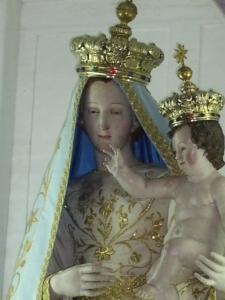 The feast of Our Lady of Grace is on 8 and 9 September.